Japan is perhaps the most headphone/earphone-obsessed place in the world. It’s home to audio powerhouses like Audio-Technica, Sony, JVC and more. ODM/OEM giant Fostex is a Japanese company. High quality cables from Mogami and high-end cable production techniques like OCC (Ohno Continuous Casting) originate from the land of the rising sun. Components from makers such as Oyaide and Furutech are universally revered for their high quality. Japan’s not all about big brands, however. There are plenty of smaller manufacturers, and many inject their own unique flavor into audio, whether it be amplifiers, DACs, or cables. Some small manufacturers have even gained some notoriety in enthusiast circles for their special attributes. What has not in the spotlight is the cadre of dedicated CIEM users. There are many owners with multiple CIEMs on head-fi, but there must be just as many (if not more) Japanese CIEM users with not two, not three, not four, but countless pairs of CIEMs in their collections. They’re an invisible force driving the enthusiast segment of the CIEM industry, soaking up a big chunk of the non-musician business. FitEar (Company Blog) is the best known company to come out of the land of the rising sun. Suyama’s portfolio is almost universally praised for being not only technically-proficient, but also involvingly enjoyable. It has already made CYMBACAVUM‘s list of best CIEM companies for 2013, and FitEar’s latest TO GO! line of universal IEMs, the TO GO! 334 and F111, has been a hit with high-end users across the globe, even with very few official international distributors and high prices. Chiba-based writer/photographer shigzeo , of Ωimage, recently wrote a brilliant piece on the FitEar production line; it really highlights the type of obsessive attention to detail that exemplifies the Japanese working spirit and FitEar’s pursuit of excellence. Perhaps the main issues with FitEar are its reluctance to do business overseas, tight control over its audiologist network, and (perhaps most of all) exorbitant prices. Yet, in the end, we forgive all, as no one else makes customs like FitEar. If there’s a company that us obsessively Japanophile audiophiles are interested in even more than FitEar, it’s CanalWorks (Owner’s Blog). 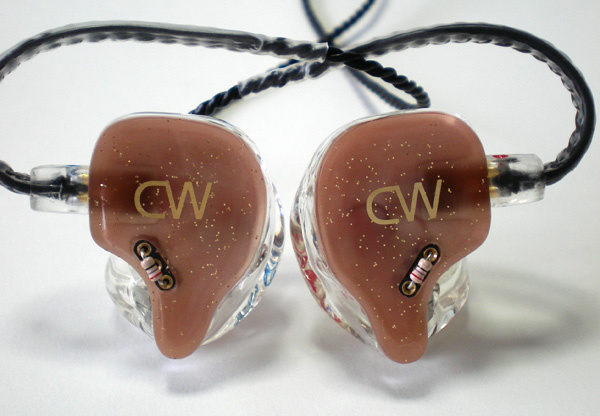 CW is a company with a product lineup far more unique than most; its single driver models are fairly straight-laced, with a high-impedance and low-impedance model much like the Etymotic ER4, but CW’s two flagship models trump traditional thinking is CIEM-verse. The CW-L51 utilizes the Personal Signature Tuning System (PSTS), an exchangeable resistor system on the L51’s faceplate that can range from 0 to 47 ohms of resistance for personalized bass tuning. It’s not quite the Ultimate Ears Personal Reference Monitor, but it comes close and seems more convenient. The CW-L05QD is equally unique in that it uses four full-range BA drivers in a crossover-less system. This was a company that I stumbled upon; I don’t suppose we’ll be hearing much about earmo anytime soon, but I love their awesome designs! I bet you’ve never heard of this company! Mr. Minato (Ameblo Blog) is an audiologist in Kobe (a large city in the Keihanshin area of the Kansai region, not the basketball player :-P) and creates CIEMs as an aside from his core practice, Kobe Hearing Aids. Mr. Minato concentrates on the art of obtaining a good fit for his clients’ CIEMs, and thus maintains a smaller clientele. While I wasn’t particularly impressed by his early efforts, it looks like his collection of works has increased dramatically from the last time I took a look at his webpage, and what’s interesting is that, beyond the single driver and dual driver BA offerings, he also has a dynamic driver model in his portfolio, the MF11. While the lineup in low in driver count, I’ve been told that the philosophy of Minatofon is one of minimalism and that Mr. Minato prefers to keep the driver count low. Prices range from ¥ 40000 – 60000, which is a fair bit less expensive than offerings from those of other companies, so perhaps Minatofon will be a budget option for Japanese users in the future. I first came in touch with Ryosuke Ito (Twitter) when I stumbled upon his personal blog. While he wasn’t a professional (and still isn’t), he seemed very well-versed about CIEMs, both in the shell production process and in circuit design. We exchanged some e-mails about some design ideas that I had, and he definitely seemed like a true DIY enthusiast. This is the way it starts for many people these days. His blog is just amazing; he’s been analyzing and modifying existing designs, and I’ll bet he already has locals clamoring for his services! Perhaps one day, he’ll get into the business full bore! Update: Kumitate Lab is now open for business! Next Entry We’re now cymbacavum.com!